Hurray! It's another transport day! This one is truly unique. We are actually doing a reverse transport. A kitty that we transported a couple months ago up north, is actually coming back down south! You might remember The Bakery Bunch family of cats. They were all named after bread: Poppy (the mom), Melba, Wonder, Raisin and Pumpernickel. We rescued them from animal control in Fort Lauderdale, FL and they went up to HART of Maine rescue. Well, Poppy's babies all found their forever homes (in pairs, yay!) and now it's Poppy's turn. 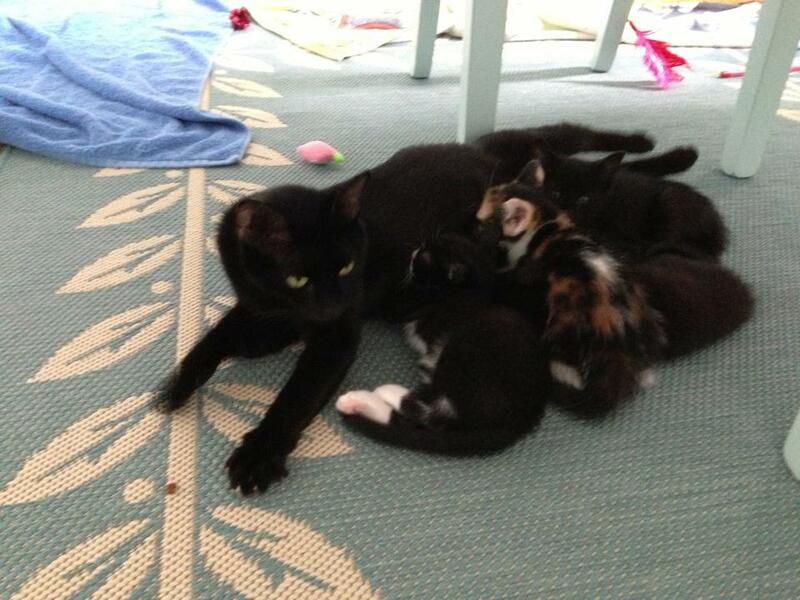 Poppy and her babies in Florida... before she went to Maine! Poppy has a very special home waiting for her. One of her original transporters for her first trip, Cutehead Melanie M., absolutely fell in love with her while she was driving her... and decided she wanted to adopt her! Rules are that kitties have to make it to their final destination (no cat-napping, no matter how much the drivers joke about it), and if you want to adopt, you have to adopt from their destination rescue. So Melanie put in an application with HART, and now we're doing a reverse transport to get Poppy back down to Georgia! Poppy lounging around her foster home in Maine. I love Poppy. She is one of the kitties who was in the kitty condo we had, and my parents fostered her and her babies after that. I don't say this lightly... she is one of my all-time favorites of all the cats we've helped. Sweetest girl ever! Yay for Poppy getting a great forever home! She will officially be the most-traveled Cutehead kitty ever! 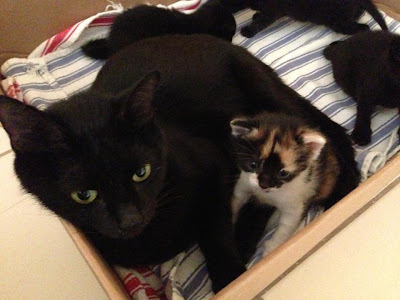 Poppy and one of her nuggets, Pumpernickel. They were super close. Also on this transport we have Sylvestra. 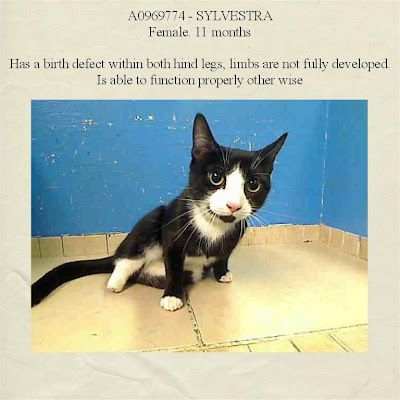 Sylvestra was saved from New York Animal Control (NYACC) and is heading to Rikki's Refuge in Virginia. She has some issues with her hind legs. 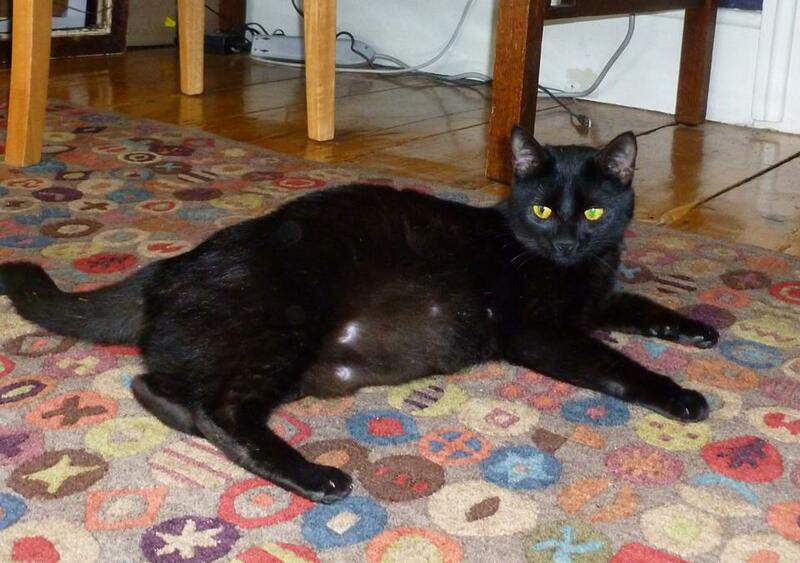 They aren't fully developed and it wasn't looking good for her there, so this is a miracle and so wonderful! Sylvestra's shelter photo in New York. Sylvestra is hopping on the transport in New Jersey and will ride along until Virginia, where she'll hop off and Poppy will keep going! It should be an amazing day! You can follow along with their transport today and tomorrow on Your Daily Cute's Facebook page and on Twitter using the hashtag #PoppySylvestra. I'll be tweeting as @YourDailyCute, of course! 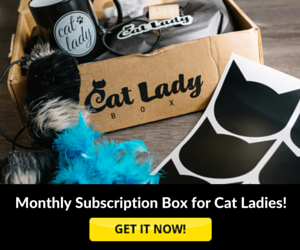 Help us cheer these kitties on! Poppy hits the road at 6:00 a.m. from Cumberland, Maine to kick things off tomorrow! Poppy and Sylvestra are all safe and headed home thanks to some amazing work by many amazing people. We couldn't do any of it without our super partners in rescue and wonderful friends. Big thanks to the fosters, Hannah D. and Colleen G. for keeping these kitties happy and loved while they waited for their ride, and Melissa F. for letting Sylvestra sleepover tonight. 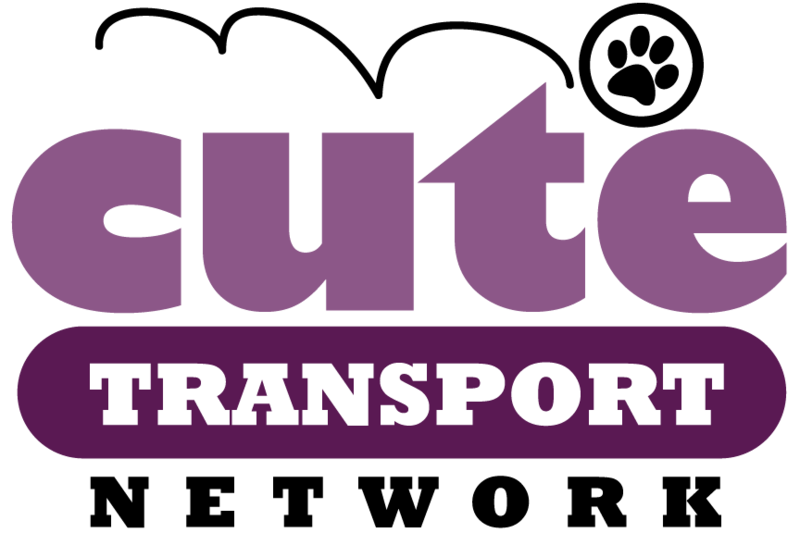 And huge thanks to all our Cutehead drivers! YOU all make this possible. Hannah D., Julianne T., Patricia G., Barbara D., Cheryl D., Linda G., Keely F. and Donna S.! And the biggest thanks of all to Melanie for giving our girl, Poppy, the best home and Rikki's Refuge for saving Sylvestra! 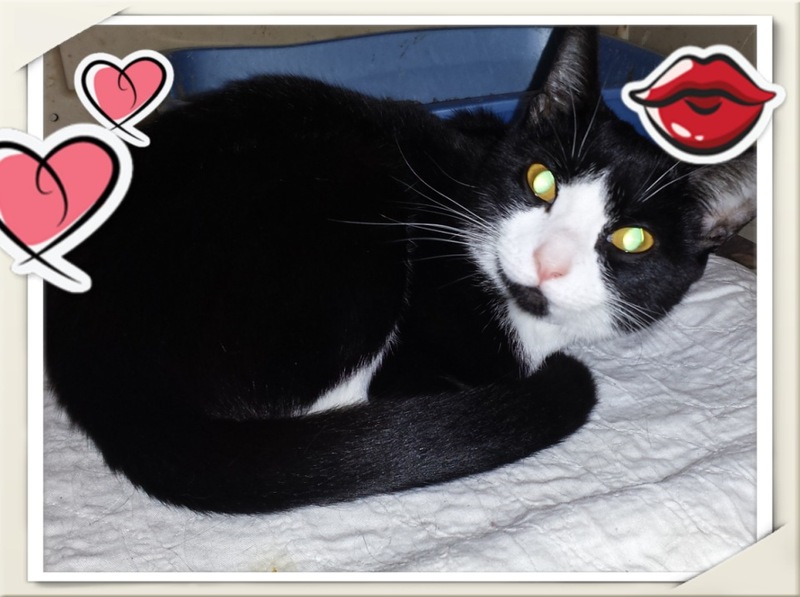 Wonderful news.....that Poppy is going to her forever home. And that Sylvestra is heading for Rikkis Refuge in Va where she will be well taken care of. Many thanks and blessings on everyone who makes these transports happen. I enjoy seeing their progress. Safe trips!! Poppy is one traveling kitteh! Thanks Melanie!! I LOVE Sylvestra what a cutie !!! Great job Cutes! This is such a great story - thank you to all who have helped these kitties and all the others!